WHEN:Customized to your requested start date of trip departure. A physically challenging hiking trip leading you hike highest summit of Central Java, volcano Slamet. Offers experiences of hiking through path of highfarmland and path of high tropical mountain forest, path of sub alpine vegetation and grounded loose rock surface of volcanic zone of volcano Slamet. You can expect to see stunning view of highfarmland, catch momentum of sunrise over volcano, view of surrounding crater area which is popular for it's "crater inside crater", and get more insight about real volcanic environment of Indonesian type A active volcano in Central Java. 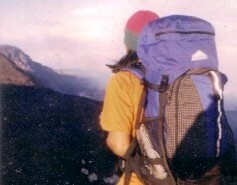 CLIMB SINDORO: A"fragrant Volcanic Summit"
MERBABU VOLCANO: Mysterious Mountain "Of Female" & "Ash"
ambo upe olenk. Picture Window theme. Powered by Blogger.